Home » 2015 Mustang versus 2016 Camaro: who wins? 2015 Mustang versus 2016 Camaro: who wins? As followup to our post showing our take on the specifications of the 2015 Mustang versus the 2016 Camaro, one question follows: who wins? Set your emotions and “tribal loyalties” aside and consider it solely from a technical standpoint. It’s very simple: on the Ford side you have an evolved S197, now called S550, about which we understand the major hard points. 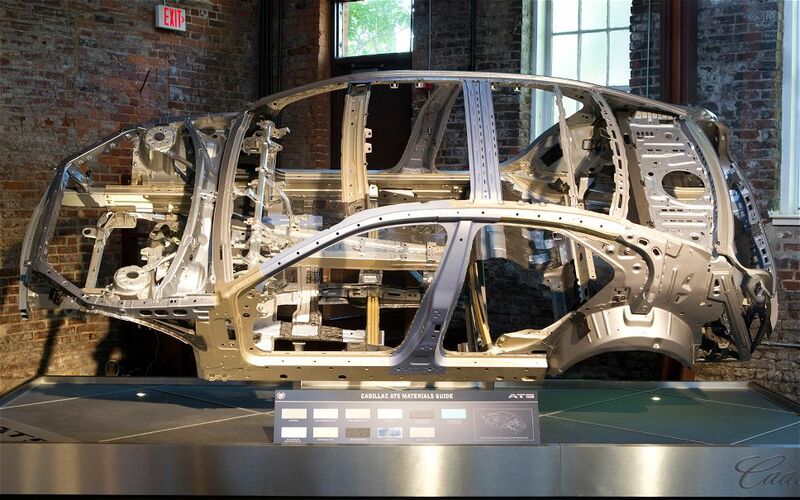 And on the GM side you have a brand new platform, sharing nothing with the past, purpose-built to save weight and designed using a strict gram strategy. And that platform already has a variety of engines, the electric diff from the C7, magnetorheological shocks, and a variety of modern transmissions (with a dual clutch in the pipeline). To build a Camaro from this platform, you basically remove 2 doors, pick your wheelbase and track, and then pick from the parts bin. You will then have a Camaro that benefits from sharing expensive and state-of-the-art parts with the higher-margin users and can be built at a Camaro price point because the other users paid all the big development bills. And it will be *very* light – the weight difference between the Camaro and Mustang that provides a major benefit to the current Mustang will be gone. The Camaro could – might – end up even lighter than the Mustang when both are in their 4-cylinder forms. And then you have the engines. On the GM side you have the 460 HP 450 tq LT1, with lots of “area under the curve”, cylinder shut off for excellent fuel economy, and likely the (bulletproof) Tremac 7-speed. On the Ford side you have a standard GT engine that will rev faster and will be more fun to drive across the rev range than the LT1, but which will not have competitive torque (even if it gets DI, which hasn’t been confirmed, it will still be down 30-40 tq). The Mustang GT V-8 will have to be a considerable step-up from the Boss engine to be competitive against the LT1. And remember, these are standard V-8 engines, not the special editions. Then there are the high-end special models for each… Ford with an unknown engine (lots of rumors there and not a single hard fact), and GM with a supercharged V-8 (paid for by Caddy and the Corvette budgets), and maybe a large displacement engine (think Z06 follow-on) in between the standard V-8 and the supercharged engine (as in ZL1). Let’s look at from another viewpoint. We’ve already seen (thanks to the latest spy pictures) that Ford is paying much more attention in the new Mustang to interior design, making a major improvement over the crude and dated ergonomics of the current car. And loading it up with optional electronics. In mid-2014 and early 2015, when the Mustang has to compete against the current old Camaro (with its terrible interior), there will be a huge advantage to the Mustang in interior design and options. For one model year. GM, on the other hand, designs far better interiors now than they did when they designed the current Camaro. Ergonomics of the 2016 Camaro will be a huge leap forward over the current car. So the competition is on, at least until late 2015 when the new Camaro is first released. Now we’ll go out on a limb, beyond what is known. In the “educated speculation” chart we created several months ago for the 2015 and up Mustang, we added special features to get ahead of and differentiate from what we already know about the Alpha platform. We added an off-the-shelf GKN/ZF torque proportioning differential to the special edition Mustangs. This would compete very well against the electronic diff that the C7 and the new CTS share, which will certainly be an option on the high-end Camaros (again, thanks to platform sharing). Ford doesn’t have the engineering budget or skillsets to create such a diff itself, but GKN/ZF has one off-the-shelf that several manufacturers already use. Thanks to the new standard across-the-board IRS, this could be easily engineered – although the software that controls it would take some time and effort. So this would be a differentiator. Then there are engines. The current Shelby GT500 engine, heavy and dated as it is (no cam timing, no DI), fits in the S550 because the engine compartment is almost identical, with the same spacing between the shock towers (only differing in the cut-backs for the lights). The bills were paid for this engine, it makes sense to keep it for a few years until something better can be engineered. That’s a differentiator (even though the supercharged ZL1 replacement will likely make more HP and tq when it comes out). Then there is a potential replacement for the Boss, which itself was an enormous differentiator. The current Camaro easily has a far better chassis than the Boss in its own track models (2 variants are offered here), and the high-end model of the two even has a 7-liter engine which Ford can’t match (and a price point far in excess of the Boss). A new Boss-type product would be an easy differentiator because Ford can, if it wants to, keep the pricepoint down against the Camaro’s own high-end track model while offering an engine a cut above what a similarly priced Camaro can offer. So this could be a differentiator… unless the GT350 (or whatever it is called, since its name and engine are an unknown) is loaded with options (like the GT500), costs upwards of 60k, and is highly marked up by dealers again. So the right track-focused model here would be a major differentiator. We also reasoned out a special model that we called the “Grande” for lack of a current name. This is just what it was originally, a more comfortable model for people who want the style of a Mustang, loaded with options, but who do not want to live with a GT model (or likely a V-8). More luxury, more economical. This could have its own engine (because more all-new engines are coming down the pipeline), or it could just focus on interior appointments and leave the engine choice to the buyer. Like the original Grande, it has to have differentiating features. Keep in mind that there has been a strong move in this direction over the past several years with lower-end non-GT models getting more and better options – which significantly increase the appeal of the car and significantly increase sales. Ford understood a long time ago that the GT model alone doesn’t sell the car in sufficient numbers to make the required profit (and to have the financial justification to reinvest). And a contest was held to design this type of model which premiered at SEMA. So whether it ends up as a separate model or not, this is the trend of Mustang option buying and the current Camaro doesn’t much play here. So this could be a differentiator. These types of differentiators would get better press than the Camaro, and make up for the cruder and less-capable chassis of the S550. There is also the “early bird gets the worm” factor. The Mustang comes out first, so has the opportunity to build a lead in momentum first. And if it has a special edition from Day One (or nearly), a special edition that is very thoroughly thought out and significant in engineering, that is just that much more momentum. It’s interesting to us that the special edition model we’ve been seeing in spy pictures lately is obviously in an advanced stage of testing. It’s running around just like the other prototypes, the suspension tuning is obviously done. That makes us think it isn’t a 2016 model as the magazines suggest, but that it will be out just a few months after the base car or even earlier. This is one way the Mustang can get ahead and maybe stay ahead.